AP Model Schools Online Application Form/APMS Inter Admissions Online Application Form/TS Model Schools Online Registration Form/AP Model Schools Inter Admissions 2019 Notification: Government of Andhra Pradesh, Commissioner and Director of School Education, Rashtriya Madyamika Siksha Abhiyan has issued AP Model Schools Inter first year courses admission 2019 notification in March 2019 and APMS and C& DSE invite the online application form from the eligible AP SSC students for admission into inter first year groups in AP Model Schools for the academic year 2019-2020. The eligible students, those who were passed the SSC are eligible for applying for Inter admissions into first year with M.P.C, Bi.P.C., M.E.C and C.E.C groups in Model Schools. These admissions are made into First year intermediate in English medium in General groups. For intermediate each group will be having 20 students. These institutions are co-educational and follow the state syllabus with Telugu as 2nd language in intermediate course. 1. Candidates who wish to get admission in A.P.Model School pays registration fee for admission of Rs. 100/-(OC & BC) or Rs.50/-(ST/SC) in A.P. online centers. 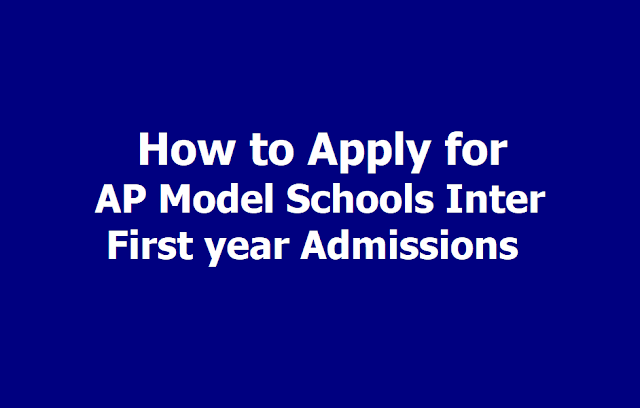 Step 2: Now, Search for link of Intermediate Admission Entry Form in to AP Model Schools for Academic Year 2019-19 and click on it. b) After uploading the data, the candidate obtains a printout of the admission application. a) All the Principals of A.P.Model Schools are requested to make available the Admission Application forms prepared in the same proforma that is available in the web site to enable the candidate to submit the application direct to the Principal (without uploading the online application form). b) The candidate can directly submit duly filled in printed admission application available in the A.P.Model Schools along with receipt of Registration fee paid in A.P.Online along with copies of the certificates listed above. c) The Principal on receipt of the application along with required enclosures record the application in separate register and issues acknowledgement to the candidate. So, Eligible candidates can apply through online mode only at cse.ap.gov.in/DSE. Here we are providing the guidelines or step by step procedure for filling the online application form. 1. First go the official website by entering the url address cse.ap.gov.in/DSE or https://apms.apcfss.in/ in your browser. Then DSE Official website portal will be appeared. 2. Now Search for AP Model Schools - Admissions 2019 for Intermediate 1st year link in this page and click on "Click Here" button. 3. Then Registration Form for AP Model Schools(Intermediate 1st year.) page will be opened in the new browser with full window and full screen. 8 OC/ST/SC/BC with serial No. Enter the Verification Code as displayed in the image in required field and read the declaration click on the radio button of Mere registration does not confer any right for Admission. Admissions will be made as per rules/regulations in vogue. Now click on the preview botton and once check form and take the print out and submit to the concerned your mandal model school principal. NOTE:- After submission of online application the same print copy for admission must be submitted to the concerned Principal of Andhra Pradesh Model School in which the Candidate is seeking admission into 1st year Intermediate along with Internet marks memo, copies of 1 .caste certificate if belongs to ST/SC/BC, 2. Annual Income certificate, 3.PH certificate issued by the District Medical Board. Mere submission of application does not confer any right for admission into first year Intermediate. Selection shall be made as per grades secured in SSC examination and as per rule of reservation.